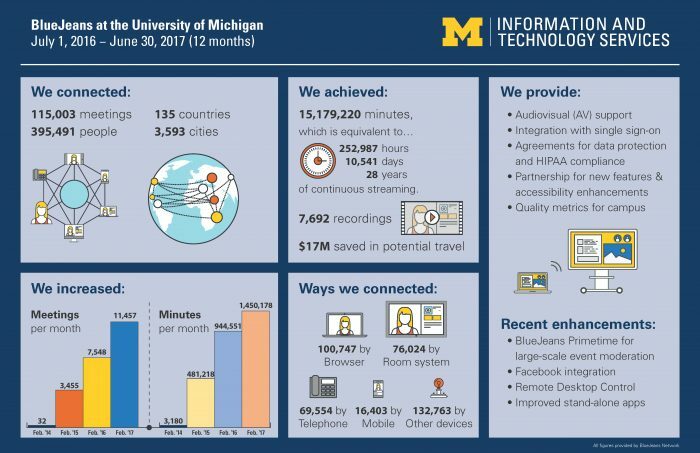 Since BlueJeans was introduced to the U-M community in 2014—thanks to a consortium of seven units that were early adopters—campus has found creative ways to use the service to connect users anywhere, anytime, and from almost any device. Todd Austin, videoconferencing lead at LSA Instructional Support Services, uses BlueJeans to connect global classrooms in ways that vastly improve the learning and research experience. Under Todd’s leadership, LSA led the university in adopting BlueJeans as the standard cloud service for videoconferencing, which is now managed centrally by ITS. ITS continues to develop campuswide solutions to enhance the use of BlueJeans. They are working closely with the Office of the Vice President and General Counsel (OGC) and other security groups to make the service HIPAA-compliant, a key factor in its use in clinical settings that handle protected health information. ITS is also creating voice infrastructure to support five-digit dialing on campus. At HITS, BlueJeans is used as a powerful educational tool among expert clinicians, medical students, and patients. A team led by Rob Levitt, senior manager for digital workplaces at HITS, has implemented BlueJeans Primetime to live-stream grand rounds, a weekly lecture that presents medical problems and treatment to a large audience. These grand round sessions can be viewed live in real-time or on demand. They also use the BlueJeans iPad app in the Newborn Intensive Care Unit (NICU) and to help Michigan Visiting Nurses transition patients to homecare. Want to get started? Learn more and create an account at its.umich.edu/blue-jeans.